Help : Financial Reports are the combination of a Report Column Set and Line Set. The report generator looks on table T_REPORT and invokes org.compiere.report.FinReport process to fill temporary table. Fix where clause based on parameters and hierarchy. WHERE isactive = 'Y' AND pa_reportlineset_id = ? If "Update Balance" is seleted then the process FinBalance.updateBalance is executed, this process update existing Fact_Acct_Balance records from Fact_Acct, and then insert into Fact_Acct_Balance the non existing records in Fact_Acct. For each column not calculation gets the select according with the AmountType of line, or of AmountType of column if line has that field blank. Then process define the work period, if it's relative subtract/add the relative value of current period for report. Moreover to this query conditions are added according to hierarchy and PostingType. Function acctBalance does the following: returns DB-CR, or returns CR-DB if account is of credit nature. If account is type N (Natural), then is credit with type is not A or E.
With founded value it updates the columns COL_X of table T_Report. If the report must list sources then it proceeds to insert details on T_Report. Then process executes calculations over calculated columns. 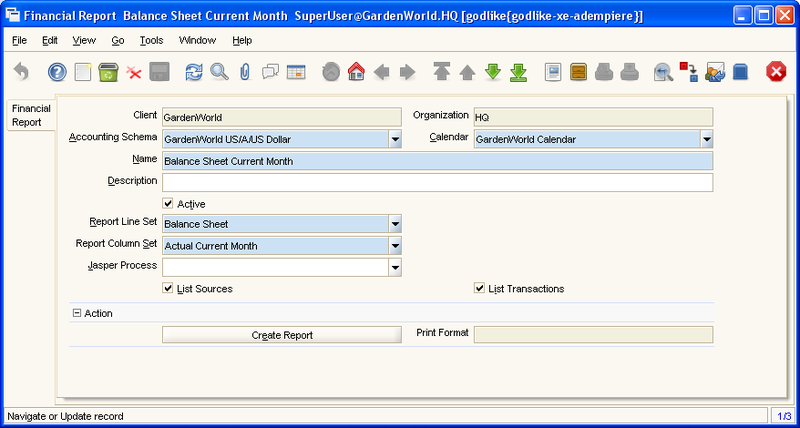 Here we show how to generate a sample Balance Sheet based on GardenWorld. This page was last modified on 5 September 2009, at 18:24.